You are probably having trouble playing Grand Theft Auto 3 with your gamepad or joystick. 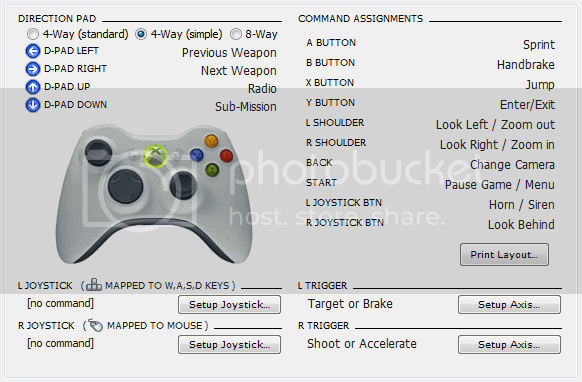 a pre-made profile for Grand Theft Auto 3 controller support. Simple. There is no profile for 360, so I decided to make one. But you will need to reconfigure the control in the GTA3 setting. I have screenshot so you can copy it in your setting. It might be problem with weapon or bomb in the vehicles or boat when forwarding. That's because I can't get the different input "Fire" on both on foot and in car due the game limitation :(. Profile for PGP is in the attached file. Let me know if any problem with this control. I only play this 3 hours, I'm kind happy with it. I just bought the classic GTA collection on Steam yesterday and I was disappointed to find that the controls weren't full configurable... in fact some functions of the 360 controller (the 2 triggers and the right analog) were just not recognized at all. After getting introduced to and acquainted with PGP yesterday, I decide to try my hand at recreating the classic PS2 control scheme for the PC version. To my surprise, it was actually pretty easy! The first step was setting the control style to classic. 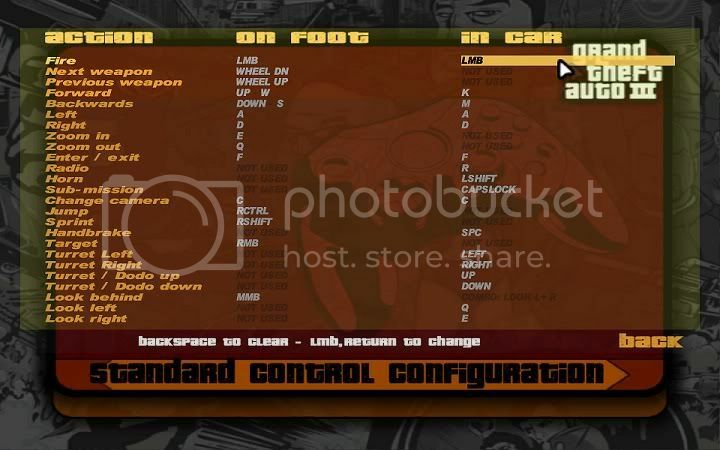 Then, using my PS2 GTA's manual as my guide of the control layout, I was able to reassign just about every working button on the 360 controller to work like it would on the PS2 (See attached picture for view of my in-game custom layout -- the main changes you should copy are the joy #'s, Q, E, and the Arrow Keys). To get the remaining triggers and analog working as well, I simply assigned the left trigger to Q, the right trigger to E, and the right analog to the arrow keys within PGP. Also, I realized at the end I didn't have a pause button to configure in-game so I set the Start button to function as the Esc key. Anyway, that's pretty much it. If you have any advice or suggestions on how to improve on this, please feel free to let me know. I hope this helps anyone else with an old copy of GTA3 or others like myself who just bought their copy on Steam. PS: I haven't tested this with Vice City, but if the general schemes are the same in both games... this might work the same way with Vice City too. 04/30/10 - Update #1: After a couple of hours of gameplay, I discovered that I forgot to set up "Next/Previous Target" functionality on the controller. After some quick exploration, I figured out how to set up the shift functions. The Right Bumper now just needs to be held down (no command attached because in-game it has already been configured for the standard target button) to change the function the right analog stick to work the next/previous target controls when tilted left and right respectively. 05/02/10 - Update #2: I've updated the pin again. I've tweaked the sensitivity a bit for the left analog to handle a little tighter like a PS2 controller (if you want to compare the difference in sensitivity with the new pin, just try walking or steering with the Left Analog and compare it using the D-pad). Another change I made within my game (but haven't shown in the control layout picture) is switching the 'behind view' while on foot to Left Analog's button (L3 on a PS2, should show as Joy #9 when pressed using a 360 controller). I figured keeping it on the Right Analog button (Joy #10) seemed pointless considering how infrequently it's used.